LGI Homes Introduces New Lineup of Floor Plans in Phoenix | LGI Homes, Inc.
PHOENIX, Ariz., Jan. 24, 2019 (GLOBE NEWSWIRE) -- LGI Homes, Inc. (Nasdaq:LGIH) unveils an array of new floor plans at the Tuscano community in Phoenix, located 12 miles west of downtown. 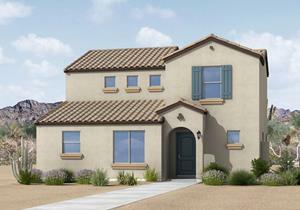 New Floor Plans are Available Now in Tuscano by LGI Homes. “We are excited to offer a unique, new lineup of floor plans at Tuscano in our newest section of the neighborhood,” said John Bargnesi, Vice President of Sales in Phoenix for LGI Homes. “These homes are designed to foster community among neighbors. Each home has an alley-load garage, which allows for open common areas and sidewalks in the front yard. Another huge perk of this new section is the maintenance-free living available, as the homeowners’ association takes care of all of the landscaping outside each home,” Bargnesi stated. “In addition, these new plans include all of the bells and whistles that homebuyers are looking for,” said Bargnesi. Every kitchen includes stainless-steel Whirlpool® appliances, a gas stove, an undermount kitchen sink, gorgeous birch cabinets and expansive granite countertops. Located throughout the homes is ENERGY STAR® qualified recessed lighting, faux wood blinds and satin nickel hardware. Also, every home comes with a 2-car garage and a LiftMaster® garage door opener. In addition to the exceptional new homes, Tuscano offers an incredible location near downtown and over $1 million invested in neighborhood amenities. Already included in the neighborhood is a community park, children’s playground, picnic area, walking trails and soccer field. Coming soon to the neighborhood is a dog park, as well as an 8+ acre city park. Three- and four-bedroom homes are available for quick move-in starting in the low-$200s. To schedule a tour, please call (855) 473-8700 ext. 306 or visit www.LGIHomes.com/Tuscano for more information.